As seen from Brooklyn, Fireworks explode over Manhattan during the Macy's Fourth of July fireworks July 4, 2003 In New York City. 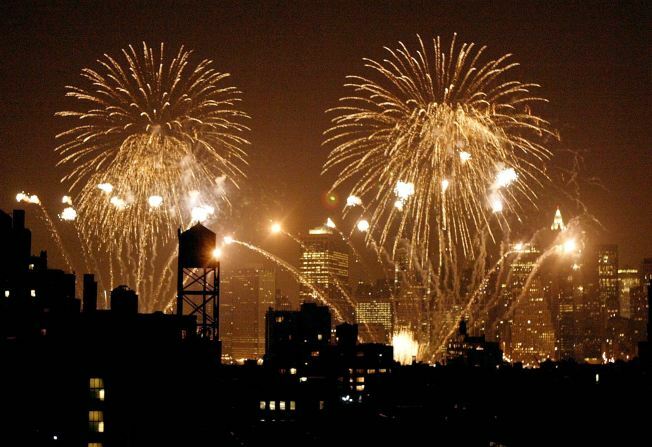 The nation's biggest 4th of July fireworks show is abandoning the East River for 2009 and instead moving its barges to the Hudson River, according to NewYorkology.com. The move is part of the NY400 celebrations, marking the four centuries since the Dutch explorer Henry Hudson first navigated the waterway that now bears his name. That means great fireworks views for New Jersey and Manhattan West Siders. A Macy's spokesman told NewYorkology that the fireworks barges will be positioned between 24th and 50th streets in the Hudson. This is instead of, not in addition to, the regular East River show, he said. The show will be engineered by SOUSA fireworks and feature 40,000 shells.